OtterBox unveiled its impressive new Armor Series waterproof cases designed for the iPhone 5, iPhone 4/S and the Samsung Galaxy S3. The Armor Series case for the iPhone 5 in particular offers the same waterproof capabilities as LifeProof's Fre enabling you to submerge your iPhone 5 under 6.6ft of water for up to 30 minutes. However, because of its thick protective design, the Armor Series case can withstand higher 10ft drops compared to the Fre's 6ft maximum as well as withstand a crushing force of up to two tons. Innovative design elements make the OtterBox Armor Series best in class when it comes to protection. Watertight latches, an o-ring seal, port covers and mesh coverings keep water out and allow the Armor Series to tolerate submersions for 30 minutes in up to 6.6 ft. of water. Vents and port covers are made of a non-permeable membrane and protective mesh layer that allows sound to move through while keeping harmful elements out. The interior and exterior of the case features advanced materials that protect the device from 10 ft. drops. Over-molded bumpers in each corner of the case absorb shock and the high-strength reinforced plastic of the Armor Series can withstand up to two tons of force. Soft interior foam provides a cushioned, custom fit for the device, while the built-in screen protector prevents scratches and damage to the glass display. Corrosion-resistant metal latches lock the two halves of the case together, providing simple, secure assembly. Port covers open easily for quick access to charging and headphone use without removing the case and a lanyard is included for convenient hands-free carrying. 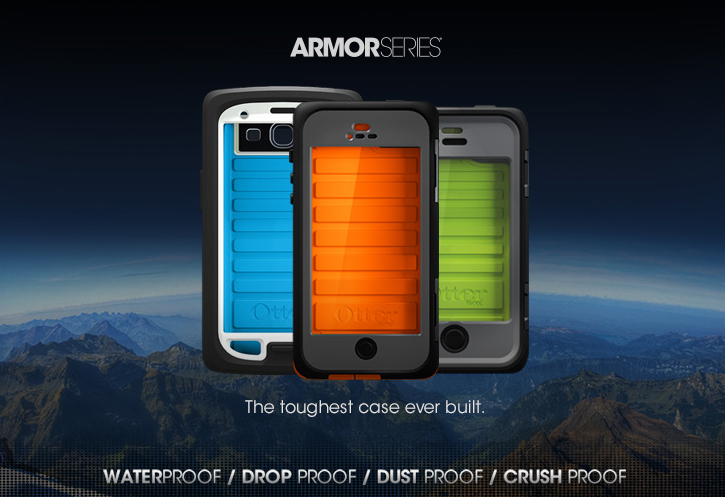 OtterBox's Armor Series case will first be offered for the iPhone 4/S starting February 22, with the iPhone 5 and Samsung Galaxy S3 variants soon to follow. No prices were announced.